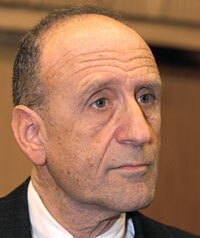 County Executive John R. Leopold, is suggesting Carl Snowden is to blame. While the Washington Capitals are on a streak against the Pittsburgh Penguins, It appears that they are not the only ones in the area that are proficient in deflecting. In what seems to be the mantra of the Leopold administration, WJZ is reporting that Anne Arundel County Executive John Leopold is deflecting the allegations against him. Rather than address the allegations, Leopold is now accusing Carl Snowden of leaking the report. Leopold suggested that Carl Snowden, civil rights director in State Attorney General Gansler’s office, may have violated the confidentiality of harassment investigations. A spokeswoman for Gansler’s office says Snowden has not seen the complaint and did not speak with the complainant until after news reports surfaced. One question not posed to Leopold is how can such a serious issue be resolved so quickly. The original incident supposedly happened on Thursday, April 30th at noon. Assuming a report was filed on Friday, May 1st. How is it that the allegations can be thoroughly investigated, deemed “unfounded” and leaked to the media by the following Thursday? At one point, Leopold even stated he was unaware of the incident. How does one investigate the incident without interviewing the accused? To watch the WJZ coverage, you can click here.